For 132 years villagers of Quorn have been able to tell the time from the black slate clock-face on the Parish Church belltower - until last Monday when it was removed for safety reasons. It had been discovered that the two-inch thick slab of slate, four and a half feet in diameter and weighing over four hundred weights, was held in place only by a one inch tube to which the hands were attached. The slender tube had bent under the weight when the fastening pins rusted through, and the heavy slate face slipped three inches and threatened to crash into the garden of remembrance below the south wall of the tower. A peal, which was to have been rung on the church bells by a visiting team on Saturday, had to be cancelled because the vibrations might have brought the clock face down. "Had it fallen when anyone was below they could have been killed, but apart from this danger the stone work of the tower could have been damaged". Said the Vicar, the Rev Stephen Jackson. The danger was removed in a hour and a half on Monday by workmen from a Derby firm of clock repairers, using chair slings suspended on pulleys from the top of the tower, they lowered the clock face to the ground in a wooden cradle. It will probably be replaced by a much lighter modern copper dial. This is one face slip which did not cause any amusement among the officers of St Bartholomew's Church. "It is going to cost us about £140 to replace the face and repair the clock," said Mr Jackson. "We are hoping that the people of the parish, apart from the congregation, will wish to help. It is the only public clock in the village which strikes the hours". The churchwardens lost no time in opening a money-raising campaign. Those attending Sunday's evensong were met by a notice headed "A Hard Day's Night" and the information, below a model clock face, that 1,440 half crown shares - at a share a minute - could more than meet the cost in one day. Already 55 shares have been promised by 13 people who signed the subscription list in the church. NB. 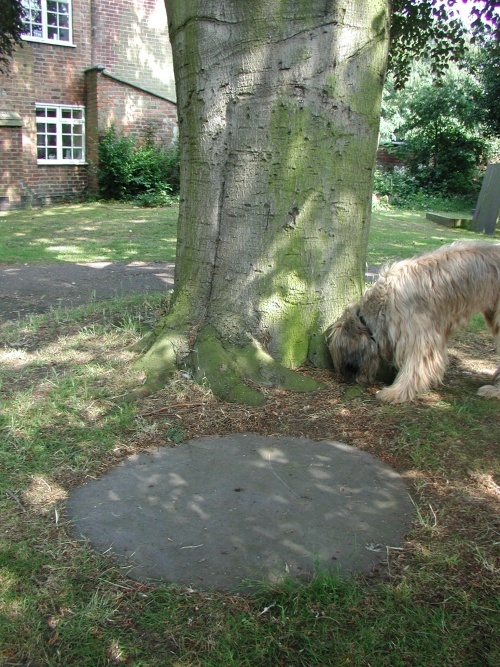 The image below shows the old clock face residing next to a huge beech tree in the church graveyard.